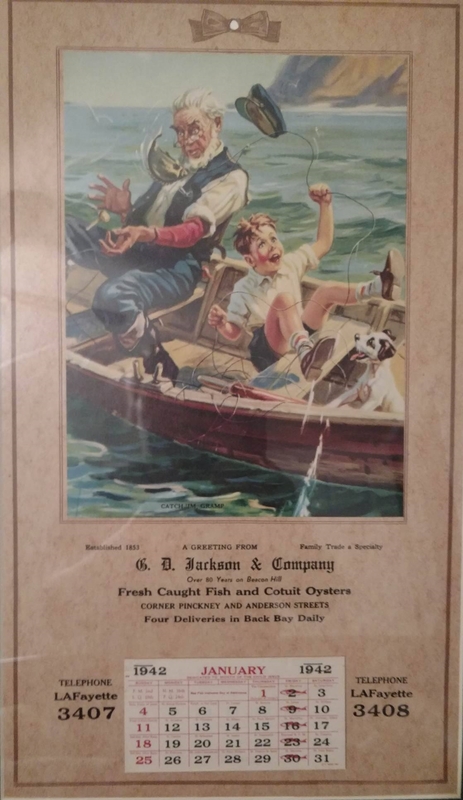 G. D. Jackson & Co., 1942. In our hallway hangs a yellowed and worn calendar that advertises a long-shuttered family business, a fish market. It’s one of those classic 1940s advertising pieces with mass-appeal artwork and a small tear-away monthly calendar below. Tiny fish mark the Fridays of the month, a handy reminder for Catholic customers. The calendar proudly boasts “over eighty years on Beacon Hill,” a phrase that recently caught my eye, reminding me of how little I know of the business in which three generations of my family had worked. I knew that my great-great-great grandfather, Gilman D. Jackson, opened the market in Boston before the Civil War. He was just 18 years old. Like his brothers Daniel and William, he left his hometown Portsmouth, New Hampshire not long after his mother’s death. But I never knew why he left Portsmouth, where both sides of his family had lived for generations, the men before him working as shipbuilders and joiners. I like to think he saw opportunity and excitement in the bigger city, that he was smart enough to work the right trade in the right place, and that his father had encouraged him to go. What follows is a story of the man, the business bearing his name – G. D. Jackson & Co. – and those who made it. The story is told through old photos, business receipts, and the recollections of later generations and placed within the greater story of Boston. The result, I think, is a unique and perfect slice of Boston history. The young Gilman first appears in the historic record in Boston’s 1853 city directory, which lists his “fish and oysters” business on Myrtle Street around the corner from the Massachusetts State House, a place physician, writer, and Beacon Hill resident Oliver Wendell Holmes, Sr. called “the hub of the solar system.” Completed in 1798, the state house attracted leading political, cultural, and business figures wishing to live in the up-and-coming wealthy neighborhood on the South Slope of Beacon Hill. State house architect Charles Bulfinch, with a few of his real estate buddies, stuck around to design a plan for the neighborhood and a few of its finer residences. Myrtle Street, however, remained a transitional area until the mid-1820s when Mayor Josiah Quincy led a “fairly successful campaign to rid the area of unsavory activities,” resulting in smaller scale developments along the edges of the North Slope. (Chase-Harrell, 30) Developers opened up narrow courts packing in row houses on either side to accommodate the lower income workers moving into the area. Buildings were nicely dressed with architectural ornament to aesthetically link the area with the more fashionable South Slope. Makes one wonder if they also passed out stylish coats to the newly arrived. Beacon Hill, 1852, on the eve of Jackson opening his fish market. 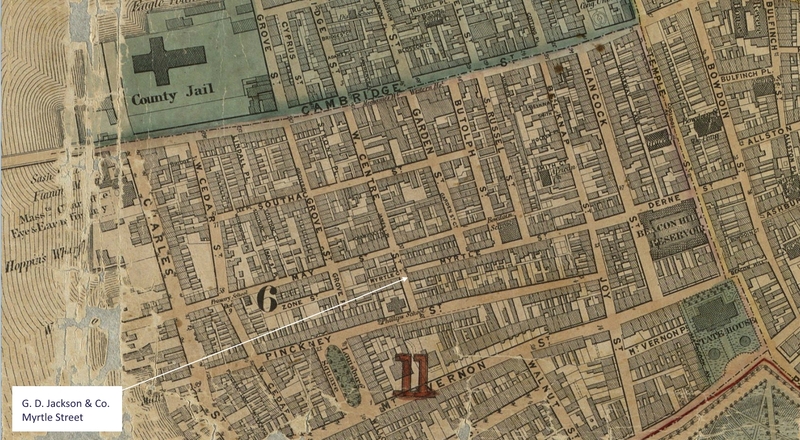 (Partial) Map of Boston, 1852. This preoccupation with aesthetics must have been hereditary. Nearly a century later, around 1920, locals formed garden clubs and preservation societies, such as the Beacon Hill Association, to build civic pride and promote the area’s historic character. Watchful women and monied types kept an eye on zoning and proposed projects while high-fiving locals who maintained tidy properties. (Taylor 53) In fact, many years later, in 1949, they recognized G. D. Jackson & Co. “for promoting the interests of the Beacon Hill District by maintaining an exceptionally attractive business establishment.” (Beacon Hill Associates, Award, 1949) I like to think our family thanked the group’s president Frank Nichols with a nice package of fresh fish. As a result, today’s Beacon Hill is a time warp. To this Midwesterner, the place feels very Old World, like something out of a Dickens novel or Sherlock Holmes story. The three- and four-story brick row houses situated around a maze of narrow cobblestone streets are of another era. One can almost hear the clacking of carriages, though thankfully the smell of horses is long gone. Retail businesses like G. D. Jackson & Co. usually occupied the basement or ground-level commercial spaces of these row houses and apartment buildings. Although, speaking of smells, let’s hope the rent upstairs from a fish market would have been discounted, or at least offset with a good deal on the catch of the day. Boston had long been a hotbed of abolitionism, and Fillmore’s visit did little to smooth over hard feelings. 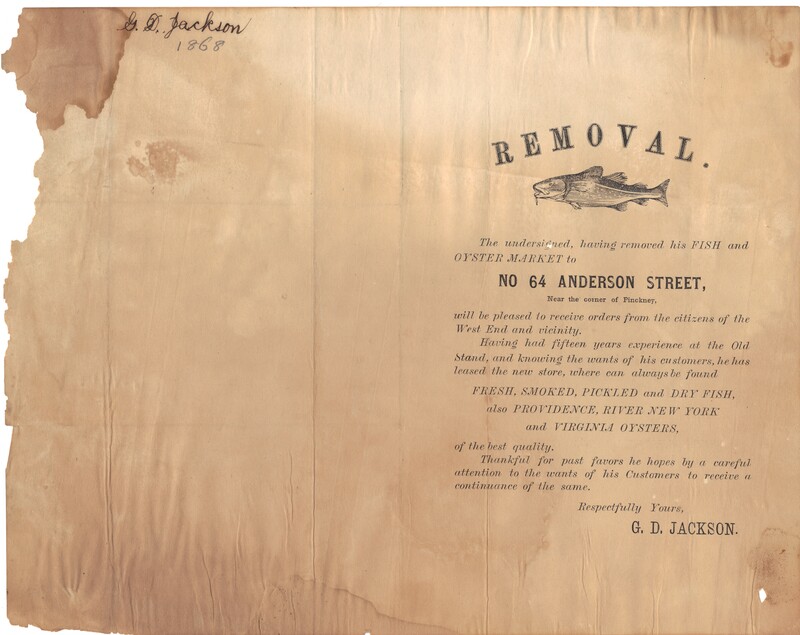 The city remained politically charged through the decade leading into the Civil War, an important period for Gilman as he built his fish market into a successful business. 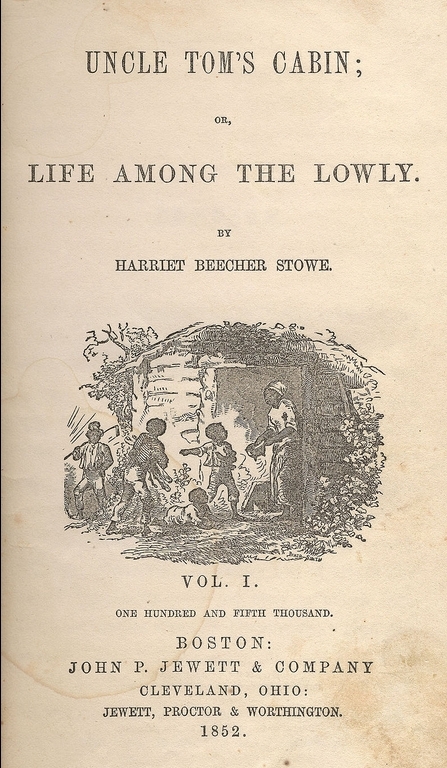 Within months of the Jubilee, Boston printer John P. Jewett published Harriet Beecher Stowe’s Uncle Tom’s Cabin, which quickly became a best-selling novel that fueled the anti-slavery cause. A few years later, abolitionists rallied around escaped slave Anthony Burns, who was put on trial in Boston and returned to his Virginia owner in 1854. (Puleo, 32) Even political moderates with even a shred of humanity were moved by the affair, as Bostonian Amos Adams Lawrence recalled. “We went to bed one night old-fashioned, conservative, compromise Union Whigs & waked up stark mad Abolitionists.” (McPherson, 120) And, on the eve of the Civil War, the Boston Transcript published Henry Wadsworth Longfellow’s patriotic poem “Paul Revere’s Ride,” meant to soften political divisions by emphasizing national history, albeit slightly fictionalized. All of this happened within a mile of Gilman’s new fish market. In fact, his shop was just blocks from an old African American neighborhood at the heart of which stood the now-famous African Meeting House, where William Lloyd Garrison and others founded the Anti-Slavery Society in 1832 and Frederick Douglas recruited soldiers during the Civil War. Unless Gilman lived under a rock, he was aware of what was going on in his neighborhood. But, I can only wonder which of the many Boston-area newspapers he perused and hope that he read such local and timely works as Uncle Tom’s Cabin and Paul Revere’s Ride. Despite its abolitionist reputation, the New England economy had benefited enormously from the Atlantic slave trade. In fact, our favorite French commentator of the time, Alexis de Tocqueville, described this as “the great social enigma of the United States” in his 1835 study De la democratie en Amerique. Writer Mark Kurlansky best summarizes the contradiction: “New England society was the great champion of individual liberty and even openly denounced slavery, all the while growing ever more affluent by providing Caribbean planters with barrels of cheap food to keep enslaved people working sixteen hours a day.” (Kurlansky, 83) The “cheap food” was often cod, or rather the lesser quality cod, which made its way to both West Africa and the West Indies. 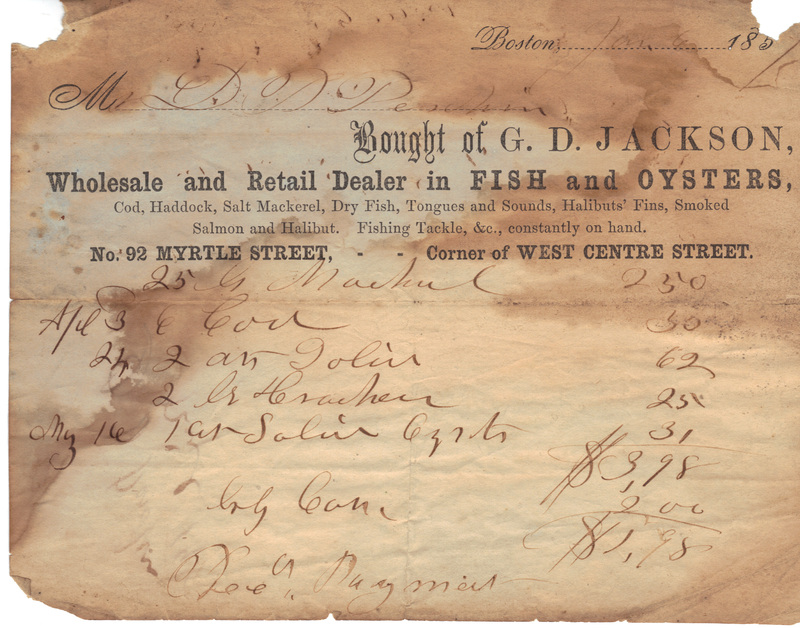 Perhaps it was this growing domestic market for fish and oysters that attracted Gilman to open his business. Average Americans living in port cities spent more on oysters than butcher meat – a lot more. (Greenberg, 20) Oysters had long been popular in Britain, gaining considerable popularity in New York and Boston in the early 19th century. Although cookbooks had long included recipes with oysters, big-city restaurant menus increasingly included oysters from 1860 to the early 1900s. A Committee of the House, comp. A History of the Emblem of the Codfish in the Hall of the House of Representatives. Boston: Wright and Potter Printing Co., State Printers, 1895. Boston Directory, For the Year 1853…Boston, MA: George Adams, publisher, July 1, 1853. Clarke, Theodore G. Beacon Hill, Back Bay, and the Building of Boston’s Golden Age. 2010. Dybas, Cheryl Lyn. “Ode to a Codfish.” BioScience 56, no. 3 (March 2006): 184-191. German, Andrew W. Down on T Wharf: The Boston Fisheries as Seen Through the Photographs of Henry D. Fisher. 1982. G. D. Jackson & Co.
Beacon Hill Associates. Award. 1949. Private collection. Greenberg, Paul. American Catch: The Fight for Our Local Seafood. New York: The Penguin Press, 2014. Holmes, Oliver Wendell. The Autocrat of the Breakfast-Table. Boston: James R. Osgood and Company, 1873 [originally published 1858]), chapter 6. Perhaps unbeknownst to Gilman, he was a very distant cousin of Holmes through his mother’s Wendell family. Kurlansky, Mark. Cod: A Biography of the Fishing that Changed the World. New York: The Penguin Press, 1998. McPherson, James M. Battle Cry of Freedom: The Civil War Era. New York: Bantam Books, 1989. Puleo, Stephen. A City So Grand: The Rise of an American Metropolis, Boston 1850-1900. Boston: Beacon Press, 2010. Taylor, Karen Cord. Legendary Locals of Beacon Hill. Charleston, SC: Acadia Publishing, 2014.